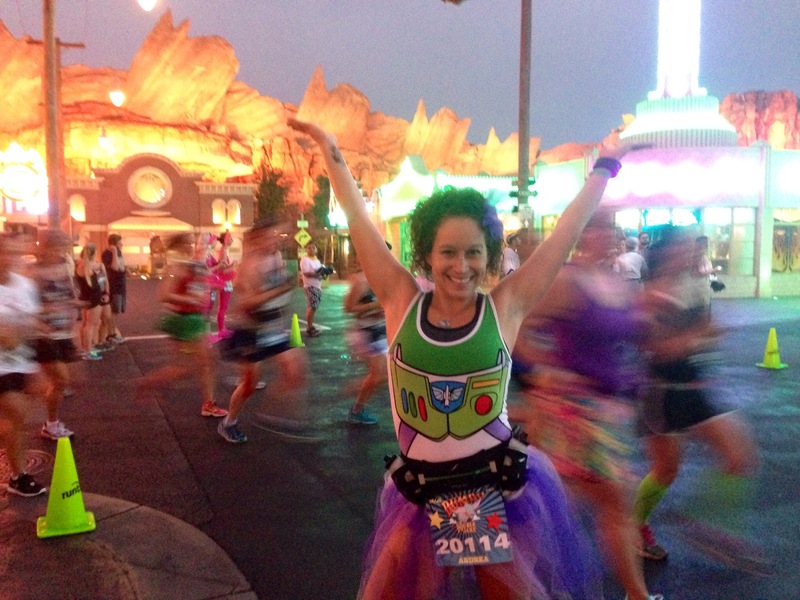 Disneyland 10km Race Recap | Je Me Souviens-To Infinity & Beyond! 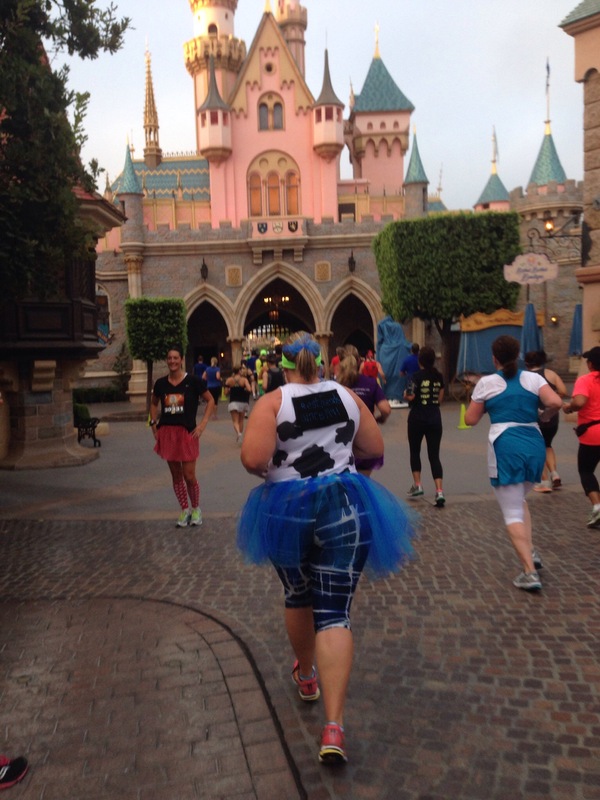 This post is about the Disneyland 10km event on August 30th, 2014. 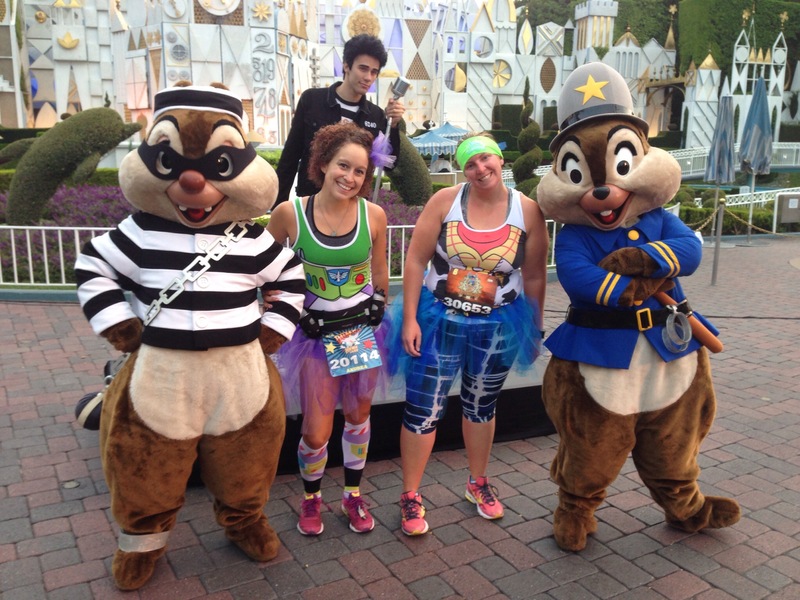 I will discuss the Disneyland Half in a later post. 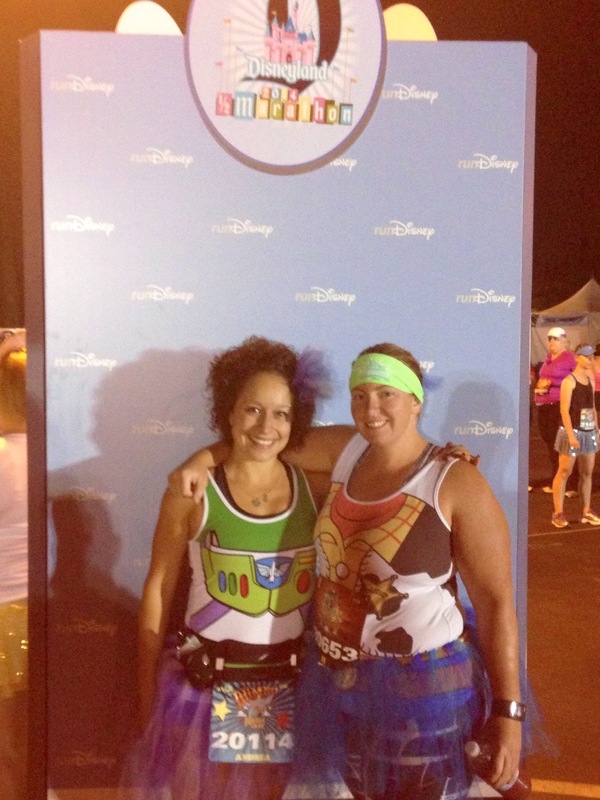 The Disneyland 10 km would not just be any 10km for me-it was extra special as I would be running with my best friend Ali. We have been friends since 1991, and this would be her first EVER 10km event. If Ali was nervous, she sure didn’t show it on race morning. My alarm went off at 2:15 am, and we both slowly got ready. By 3:15 we were on the road to pick her mom up from the Redondo Beach Holiday Inn Express. By 3:50, we were pulling into the Mickey & Friends Parking structure. Yes Ali, this in fact was happening! We hung out in the pre-race area until 4:45. It was here that we danced a little to the DJ music, did some stretching, and used the porta potties one last time. We headed over to the corrals before things got too crazy in there, and by doing this early, we were able to place ourselves right near the front of Corral B. We stood to the left of the corral, and by doing so Ali’s boyfriend and mom could talk to us before the race began. 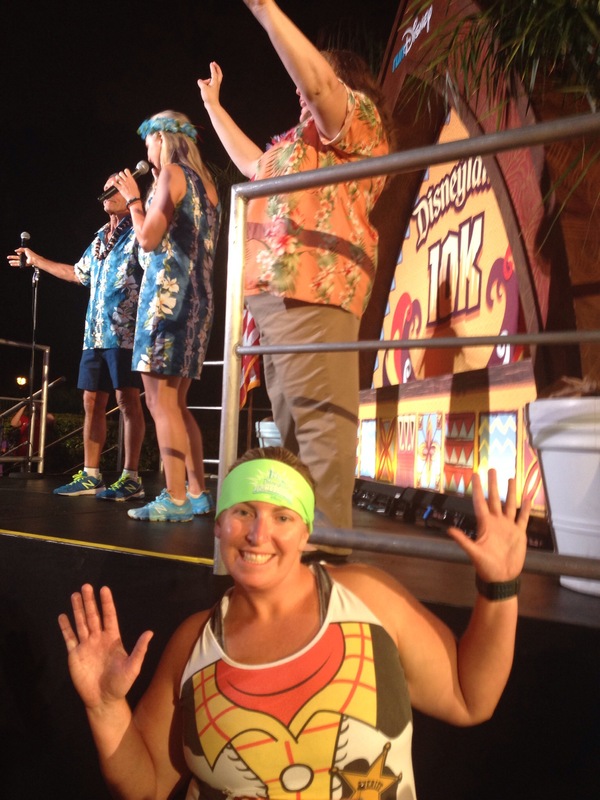 The race was themed “Hawaiian” with all the commercialized island decor that you would expect. 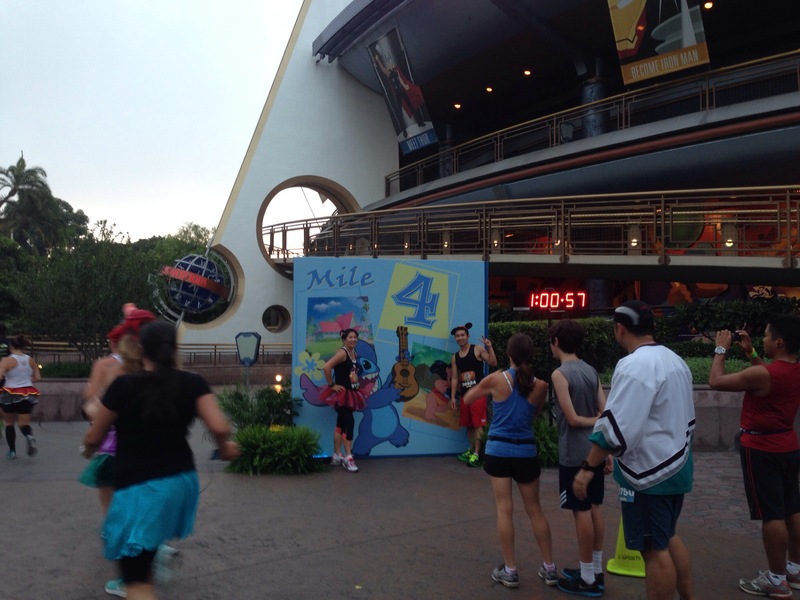 Stitch, from the movie Lilo & Stitch, was the unofficial mascot of this event, so they rolled with this theming throughout the 10km event. 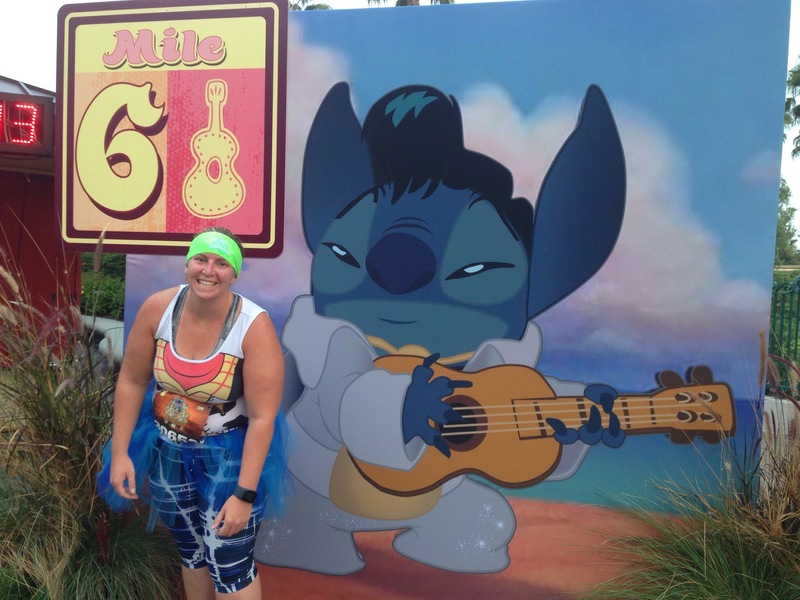 Overall, I thought the theming was cute, but got a little sick of all the Elvis references everywhere you ran (apparently Lilo is obsessed with Elvis in the movie?). Anyway…. Race began and I was nervous for Ali, mainly because I wanted her to have a great experience. I knew her experience would be great if we paced ourselves accordingly and took our time while near some great photo opportunities. 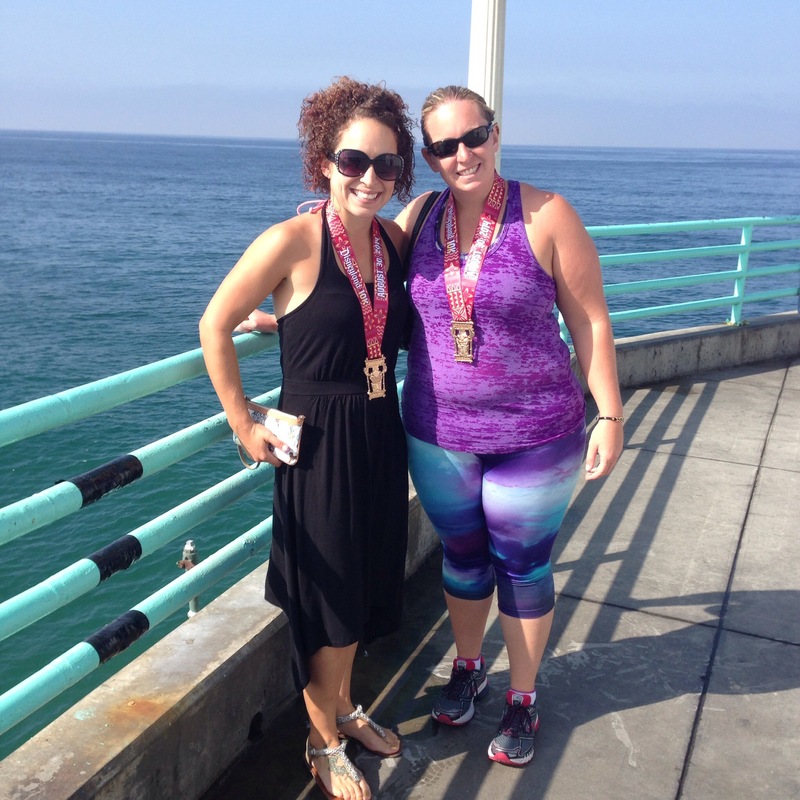 This race was not about a race time for me, but about spending time with my best friend. 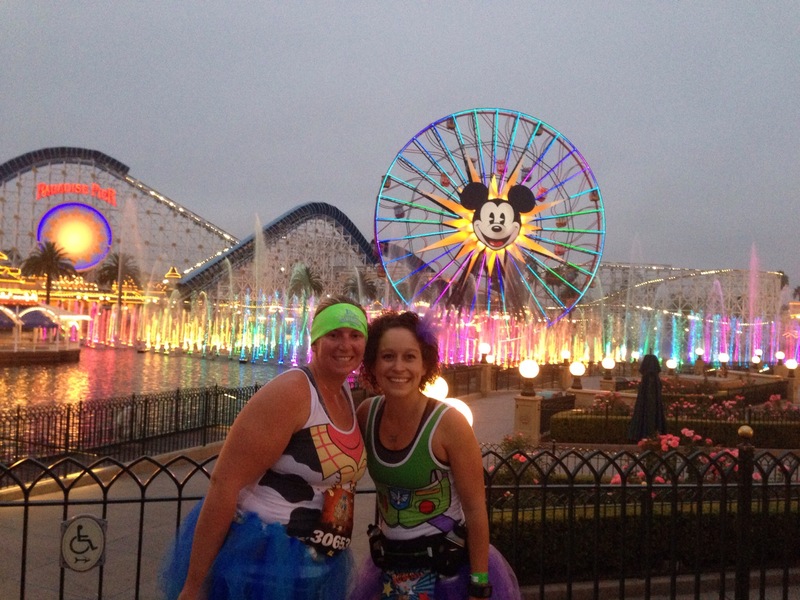 When we entered California Adventure near mile 2, the scenery was outstanding. We took many fantastic photos with little to no wait. After winding around California Adventure, we saw Ali’s mom and boyfriend near the main gate. We entered into Disneyland and down Main Street we went. Nothing will beat the experience I had running down Main Street USA in Disney World this past January, but this was still pretty damn awesome! 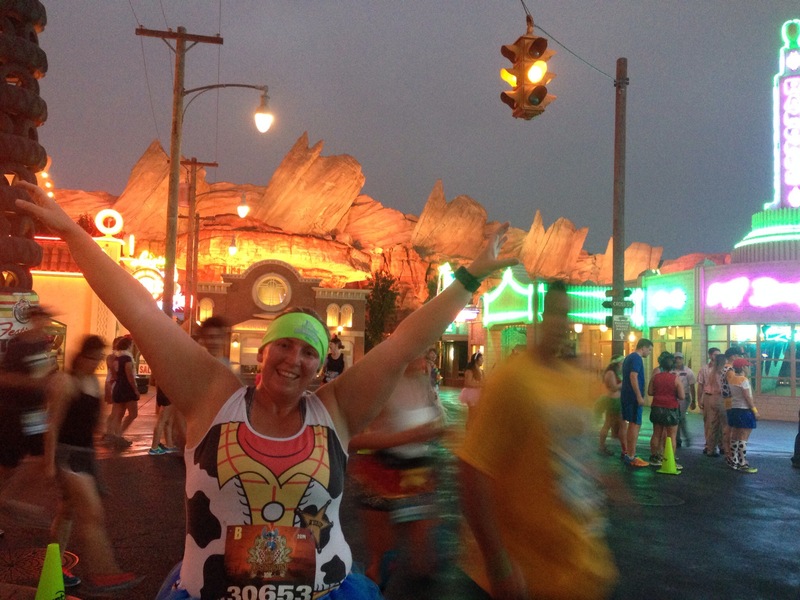 When we got to the mile 4 marker near Space Mountain, Ali said something around the likes of “Well, we have now entered uncharted territory.” The farthest she had run during her training was 4 miles. We had 2.2 miles left to go. I knew she could do this, it was so close to being done! We decided to take an unscheduled photo stop in front of It’s a Small World to see Chip & Dale. This line took a solid 10-12 minutes, but I think the break was necessary in order to make that last final 2 mile push. 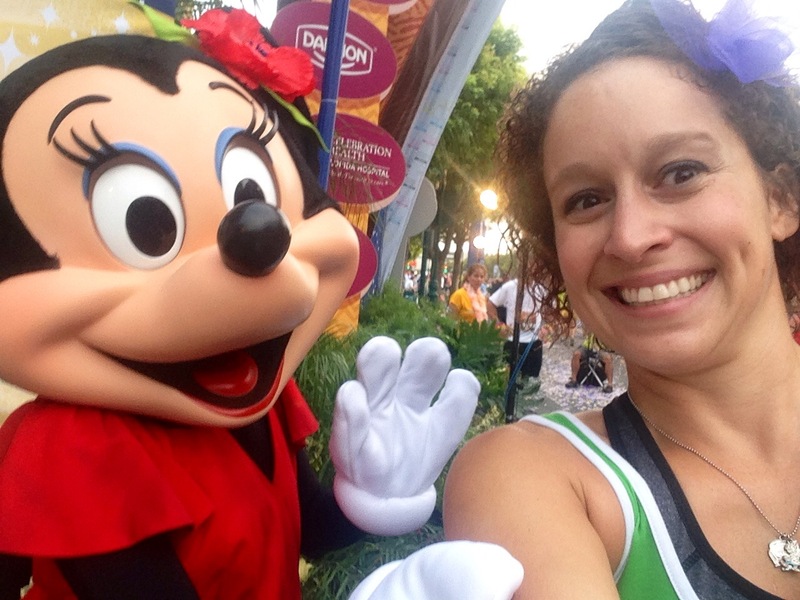 We rounded through the backstage area, and into Downtown Disney. The crows lining the walkways in Downtown Disney were awesome! So many people there to support, and it really gave out some positive energy! Great recap! 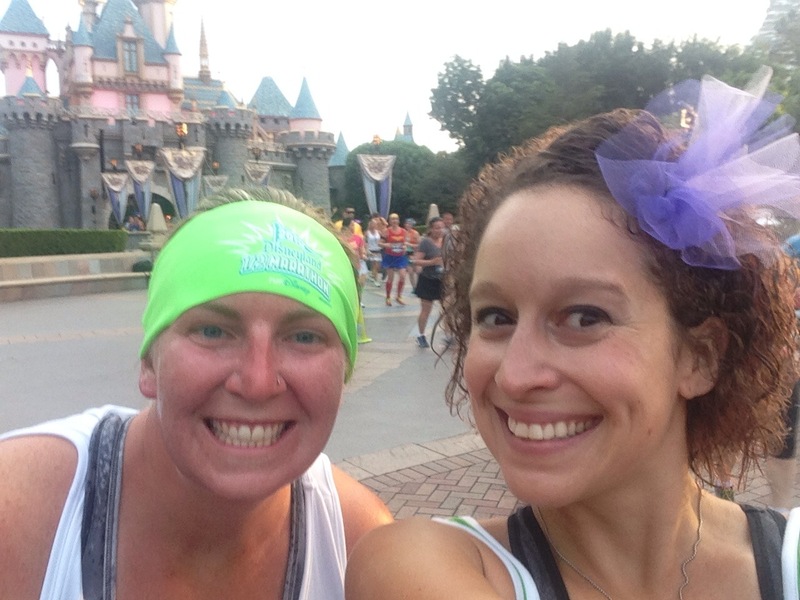 Running with friends rocks!! 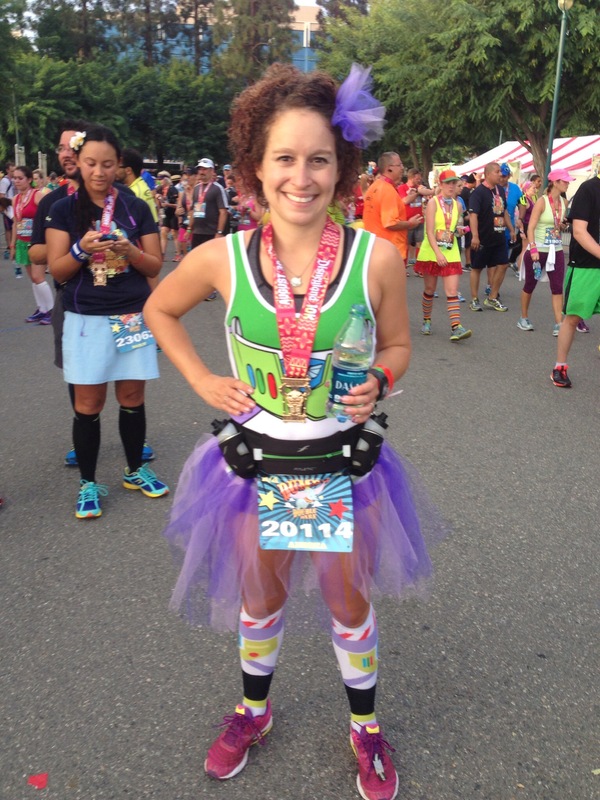 I will never forget the experience of running and pacing my friend Mitzie during her first half marathon. 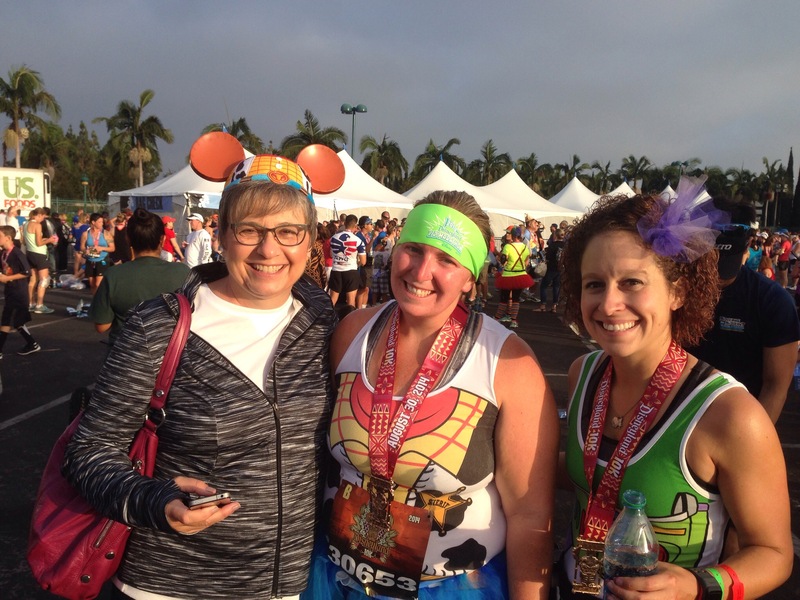 Helping out fellow runners and friends during a “first” race experience is so much fun!